Anyone who’s ever made a copy of a copy of a video tape knows about the degradation that duplication can cause. 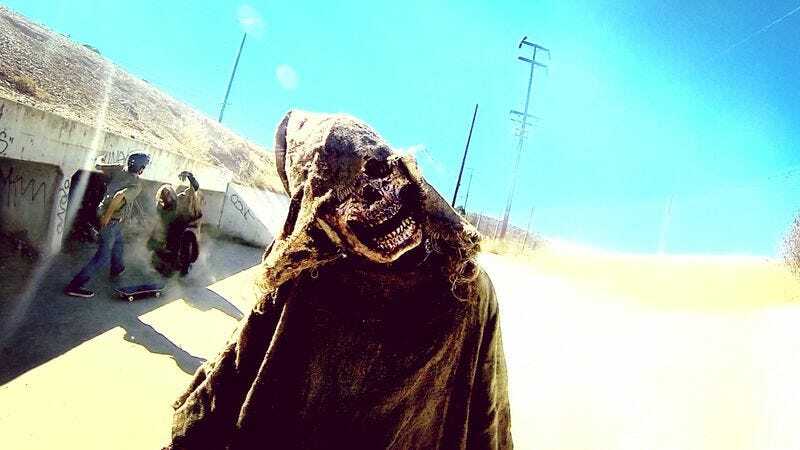 But in the case of the V/H/S series, generation loss seems to have, well, skipped a generation. Far from a downgrade in quality, last year’s V/H/S/2 actually improved upon its predecessor, offering a swifter, scarier, and more inventive collection of handheld horror shorts (including one miniature masterwork worth the price of admission alone). Had that pattern continued, genre buffs might be looking now at an omnibus fright flick on par with, say, the classic Dead Of Night. Here, instead, is V/H/S: Viral, a sequel so slapdash and ineffectual that its army of directors—six of them total, counting the poor sucker whose contribution got axed—might well be accused of intentionally burying the franchise. More charitably, perhaps they were trying to put a nail in the coffin of all found-footage horror. Some good must come from this much bad. Just as the first two V/H/S movies found characters using a VCR to watch the various vignettes—all of which were digital, but oh well—the third installment also incorporates its titular terminology into the framing narrative. Yes, there’s another useless wraparound segment, and this one involves the dissemination of deadly viral content. With this angle comes a little more conceptual flexibility; as each short-form shocker is meant to be a fully edited video, the filmmakers aren’t forced to create the impression of untouched raw footage. Not that they do much with their new freedom. “Dante The Great,” featuring a murderous magician, is shot in the style of a documentary (complete with talking heads), but its acting and special effects are so abysmal that the illusion (har har) never comes across. And then there’s “Bonestorm,” about a skating video gone wrong; it has all the charm of a skating video gone right. Scenes of obnoxious teenagers bashing robed fiends with their boards shade from “chaotic” to “incoherent.” There are surely better uses for the GoPro than keeping it planted in the blank faces of a junior Jackass crew. Skateboarders fighting ghouls? Evil illusionists? “Bonestorm?” V/H/S: Viral is like some half-assed, live-action remake of a Treehouse Of Horror episode, only significantly less frightening. To that end, its best segment—its only halfway decent one, really—is also its most intentionally funny: “Parallel Monsters,” by Timecrimes director Nacho Vigalondo, chronicles a meeting between alternate-dimension doppelgängers who discover that their identical realities aren’t so identical after all. Though the punchline could be better, Vigalondo creates both tension and humor through the crosscut exploits of his double protagonists. Formally and dramatically speaking, it bears the mark of an accomplished, professional filmmaker—a compliment one can’t easily pay the other chapters, which range from sloppy to downright incompetent. Real amateur videos tend to be less amateurish. Certainly, they’re more entertaining.